Jellyfish have received a large amount of attention on Long Island in recent years. Although a natural predator in our waters, “the blobs of summer” – as one reporter coined them – seem to turn everybody (from swimmers for their painful stings, to fisherman for their net-clogging tendencies) against them. The term “jellyfish” is actually a misnomer, since these delicate animals are not fish at all. In fact, our local jellies encompass three distinctive phyla, or groups, of watery animals; the stinging Cnidarians (a group that includes the medusa-like jellyfish as well as sea anemones and corals), the barrel-shaped (and non-carnivorous) salps and doliolids, and the Ctenophores, non-stinging jellies that are as voracious as they are beautiful. 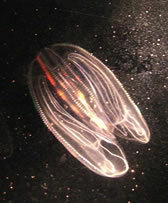 Of all the jellies in our local waters, ctenophores are the most voracious. While they don’t sting, ctenophores consume tremendous amounts of young fish, shrimp, clams, and crabs during seasonal “blooms” in abundance. We are particularly interested in understanding the predatory impact and population dynamics of ctenophores in Long Island estuaries. Historically, ctenophores on Long Island bloomed in late summer and early fall, well after many commercially-important fish and shellfish species had already spawned (released their young into the water). Our research has identified changes in the seasonal appearance and maximum abundance of these important predators in Long Island waters. 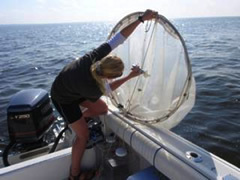 Peak (maximum) abundance of ctenophores in Great South Bay in 2006, 2008, and 2009 were a factor of two to five times higher than previous studies conducted two decades ago. Furthermore, peak abundance of ctenophores occurred two to three months earlier than previously-documented. Increasing ctenophore abundance, especially at times when they were not historically abundant may have significant consequences for marine food webs. For example, in 2006, peak abundances of ctenophores overlapped with spawning events of the commercially-important hard clam in Great South Bay at a time when ctenophores were projected to consume nearly 100% of the bivalve larvae present. Such changes in the abundance and distribution of ctenophores may help explain why, despite reduced fishing pressure and ongoing restoration efforts, hard clam populations in Long Island estuaries are not recovering in many locations. Ongoing research focuses on the feeding ecology and food web dynamics of the ctenophore Mnemiopsis leidyi in Great South Bay. We are particularly interested in understanding how zooplankton prey availability controls ctenophore abundance and distribution. I am also interested in determining the role of eutrophication (excess nutrients) in structuring the plankton community in the presence (and absence) of M. leidyi.